Around the country, Americans are cooking up hamburgers and bratwursts on their barbecues, embarking on backcountry camping trips, and preparing fireworks displays to celebrate the Fourth of July. In the Southwest, those celebrations will be markedly different. Fire restrictions — and in some cases closures — are in place for many national forests in the four corners region of Utah, New Mexico, Arizona and Colorado. Officials hope to avoid adding to the wildfires already burning there and across the West, including in Alaska, Northern California and Oregon. Over a dozen fireworks celebrations have been canceled in Colorado mountain towns, which often depend on the holiday to bring in tourism revenue. The cancellations aren’t new, but they are more prevalent this year as the Southwest grapples with a severe drought. While precipitation levels vary from year to year, all signs point to further aridification in the region over the long term. This year may illustrate the likely changes to come as communities across the West are forced to confront challenges to their economies — and their quality of life. 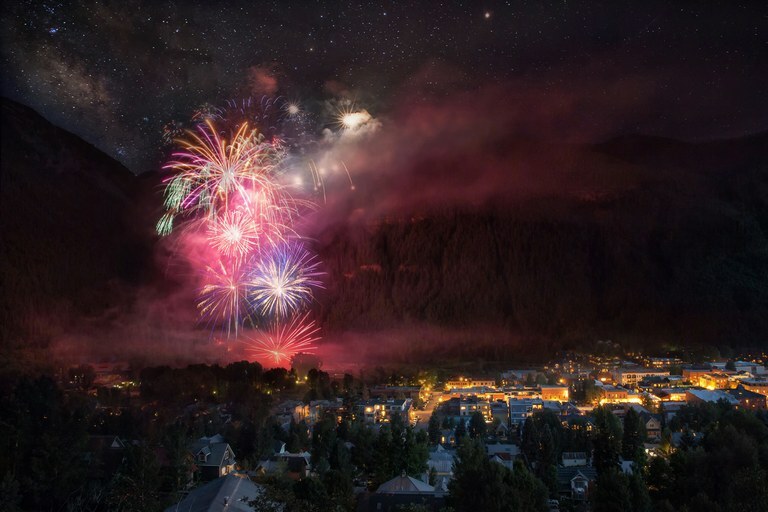 The town's 2016 firework show explodes over Telluride, Colorado. This year the show has been canceled due to the area's strict fire restrictions. Take the town of Silverton, Colorado, for example. This year’s weather hit the town of 630 people doubly hard. First, a bad snow season delayed the town’s ski resort opening date until mid-January; then drought brought forest closures and fast-moving wildfire, including the 416 Fire, which closed off one of the main gateways to town. The blaze also halted service of the narrow gauge train, a major tourist attraction, between Silverton and Durango. Those factors, and the ensuing media coverage, led to a “tsunami of lodging cancellations for all the summer season,” said DeAnne Gallegos, executive director of the Silverton Area Chamber of Commerce. The town usually makes most of its money during the summer months. This year, however, Gallegos estimates the summer economy is down by 60 to 80 percent, with businesses along the train route faring even worse. Fourth of July is typically the area’s biggest summer draw, but this year the town had to cancel its fireworks. Nearby towns, including Durango, Ouray and Pagosa Springs, also decided to skip the pyrotechnics this year. Where officials have the financial resources, however, they are embracing new forms of celebration. Glenwood Springs and Steamboat Springs have scheduled laser shows, and Aspen is advertising a patriotic drone light display in lieu of explosives. Closer to the Front Range, Breckenridge town council members acknowledged that doing away with fireworks might be a permanent reality. “If we see our summers continuing to get hotter and drier that’s definitely going to be probably more of the future,” Breckenridge spokeswoman Haley Littleton said at a city council meeting last week. In addition to fireworks cancellations, most of the national forests in the region are under at least Stage 2 fire restrictions. That means anything that can produce a spark is forbidden, including campfires, barbecues, smoking in open areas, target shooting on public land and using tools like chainsaws without a device to stop sparks. The situation is dire enough to close many national forests in the Southwest. In New Mexico, for example, the 1.5 million-acre Carson National Forest shut down last week — a month after the Santa Fe National Forest closed. The Cibola National Forest has also been closed since mid-June. In Arizona, where several wildfires have cropped up, popular areas in the Prescott National Forest, the Tonto National Forest, and the Apache-Sitgreaves National Forests have also been shuttered until conditions improve. As the climate changes, these types of forest closures and fire restrictions will continue to strain town coffers around the West. That means places like Silverton will be tasked with examining their identities as weather-dependent tourism economies. For Gallegos, that realization is hitting home now as the residents of her community take financial hits in order to keep their businesses open and their neighbors employed. “When you live in a high alpine town that is completely connected to Mother Nature and the weather and tourism … it impacts you that much more dramatically and exponentially,” she said.